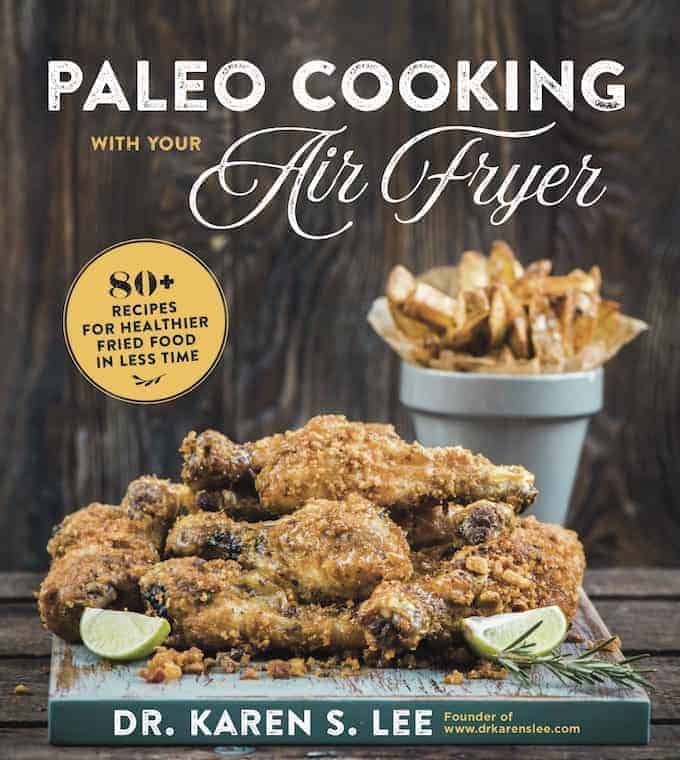 Paleo Cooking with your Air Fryer cookbook has 75 air fried food recipes and 5 basic staple recipes that are healthier than deep-fried in oil! 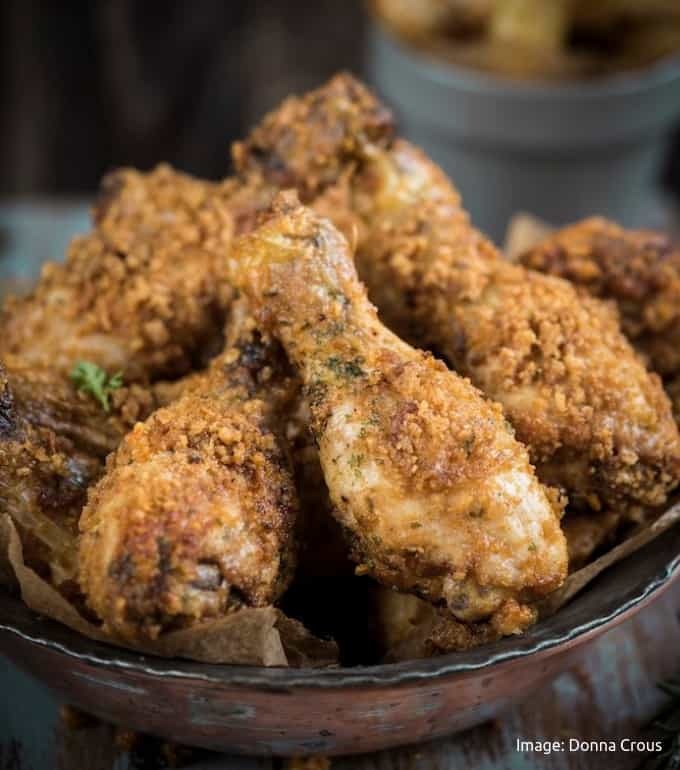 If you are on the Paleo diet and want crispy and tasty recipes, my new cookbook’s fried classics – including this fried chicken and fries on the cover – will become your family’s favorites! If you’ve been a reader of my blog for some time, you know I am a mom to children with food allergies and food sensitivities related Eczema. I try to help them with their allergies with holistic methods, put them on an elimination diet numerous times, and even on the GAPS diet. But when my children had to go back to college and couldn’t continue with the strict GAPS diet, they started on the Paleo diet with great results. Naturally, my husband and I became Paleo eaters as well, although, we modify it a bit sometimes. We adhere to the main principles of Paleo most of the time, especially, when we eat with our children. We eat grain-free (except for rice since my children tolerate rice without problems), grass-fed and pastured meats, nuts, seeds, seafood, fruits and a ton of vegetables. We avoid processed (or packaged) foods, legume, dairy, added and refined sugar. But because the “right” texture is difficult to achieve without using grain flour (and a ton of sweetener,) we rarely eat baked goods. And fried foods… I tried “baking” (ironically) fries, chicken, fish, chips to make them crispy in the oven but I never succeeded in making them even close to being deep-fried. Beer battered fried chicken was one of our favorite foods and I tried to make the grain-free or gluten-free batter for crispy texture without frying in a lot of oil because excess oil made my husband nauseous but my children didn’t appreciate the clumpy texture of gluten-free batter cooked, not fried, in oil. So as you can imagine, as a cook, it was frustrating for me fail on achieving the same result as deep fried chicken. I even tried “baking” them in my convection oven on a cooling rack to allow the hot air to circulate around the drumsticks. In theory, that’s how air fryers work. But still, making them on a raised rack turned out to be more messy and a hassle than it was worth. So, when I heard about a seemingly trendy kitchen appliance called the air fryer, it got my attention. I bought the Philips Avance XL and I fried evvvvverrrrything! I even tried frying rice to make crusty and sizzling rice. Not kidding. Then, late year, a publisher asked me to write a cookbook on Paleo cooking using the air fryer. I have to admit, I thought it was going to be a bit gimmicky but how can you turn down an offer to write a cookbook from a publisher? Air fryer cookbook wasn’t exactly what I had in mind as my first cookbook but hey, food is food and I think any appliance that makes cooking and eating fun is a win-win in my book. No pun intended. Paleo eating is challenging enough; we should have fun cooking them and eating them right? So after several months of air frying several dozens of recipes, Paleo Cooking with your Air Fryer (Amazon affiliate link) was born. This book was a result of some of our favorite recipes and some classic ones. My family has regained their love for fried foods and I am happy to report my failure rate for Paleo fried food has been almost non-existent, thanks to the air fryer. The book will be available for delivery on October 2, 2018 and is available for Pre-Orders now. And when you order before October 2, 2018, you will receive the following BONUSES from me! Just email me the screenshot of your order with your shipping address. An automatic entry to a giveaway for a chance to win a Philips Avance Digital XXL air fryer (valued at $500) which is a bigger than the smaller model, Avance XL that I used to write this cookbook! I chose this brand because it has a stainless steel wire basket where the food touches and you know how I feel about Teflon! And Philips was generous enough to offer their latest model XXL for my book launch celebration giveaway! 10 Easy Paleo Cooking with your Air Fryer – 3 “sneak peek” recipes are from the cookbook and 7 NEW recipes are bonus recipes in an immediate downloadable eBook. 2 FREE weeks of meal planning from 20 Dishes. Find the details about the BONUSES on this page. Look at some of the scrumptious recipes from the book! 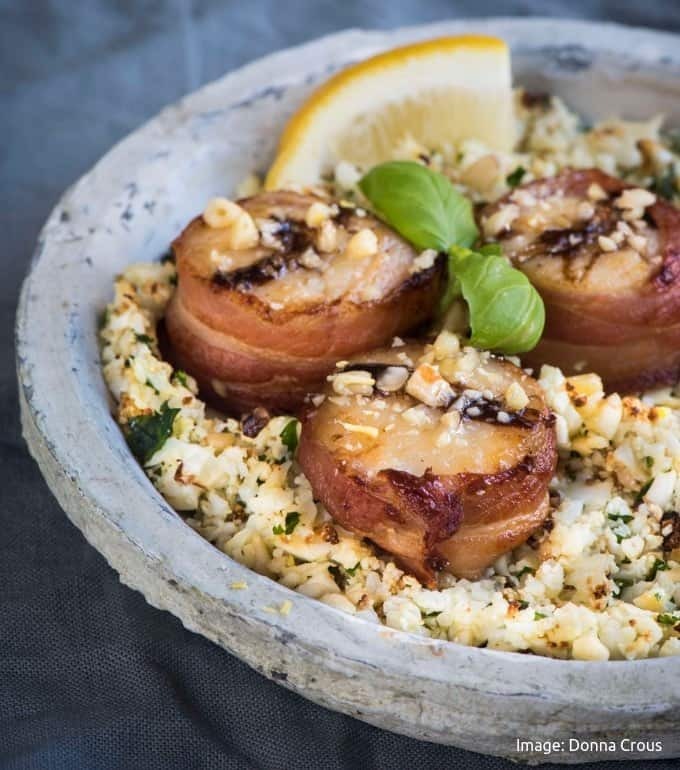 Bacon Wrapped Scallops with Balsamic Reduction – takes no time to make these delicacies! 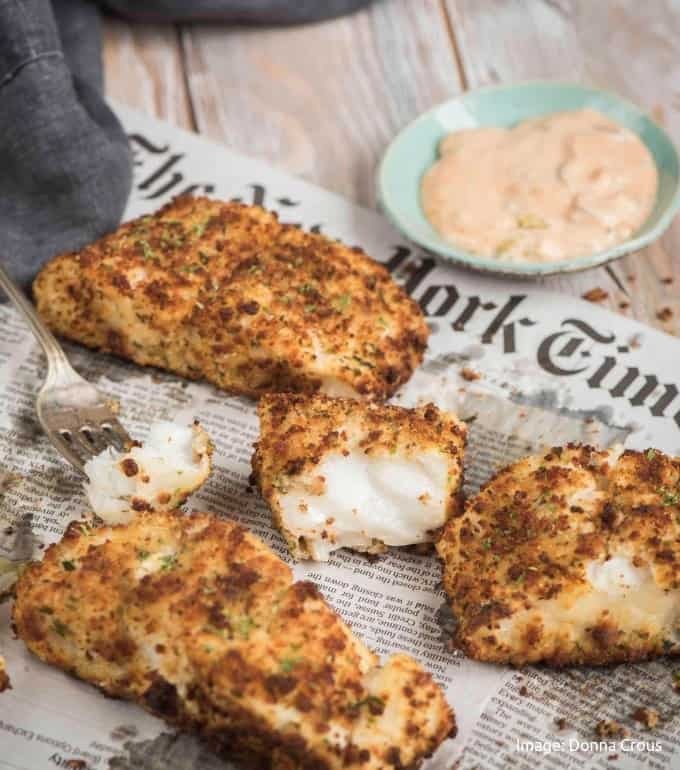 Cajun Fish Fry – crispy on the outside and flakey on the inside fish fillets! 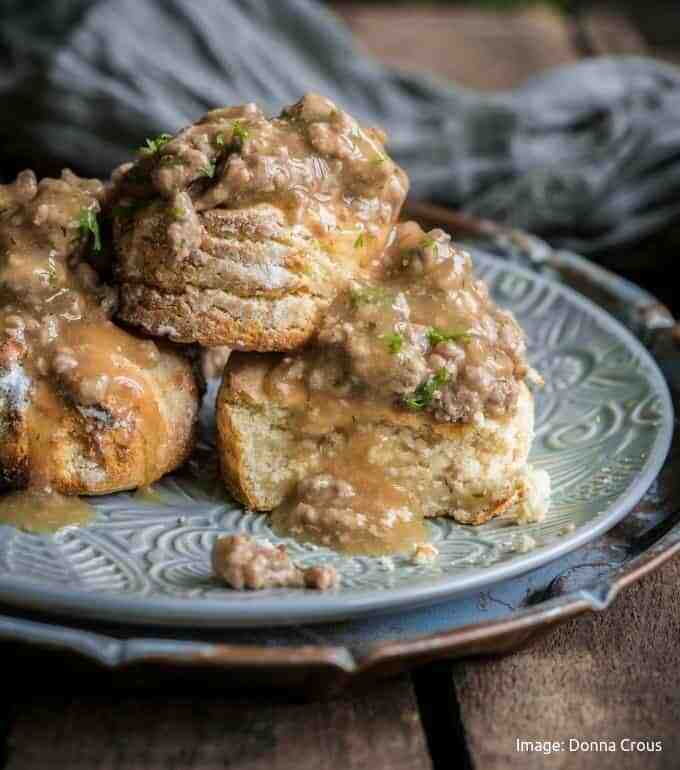 Biscuits and Gravy – YES. You can bake in the air fryer too! Head on over and read what others are saying about Paleo Cooking with your Air Fryer cookbook and order today! P.S. The amazing photos were taken by a talented food blogger/photographer Donna Crous of Eighty20Nutrition. Check out her blog for scrumptious Paleo recipes!